A long-promised road connection has taken a major step forward today with the NSW Government releasing a detailed design for the Western Harbour Tunnel and Beaches Link for further community consultation. The Western Harbour Tunnel will create a western bypass of the CBD and take pressure off the Sydney Harbour Bridge, Anzac Bridge and Western Distributor. It will also cut a journey from Olympic Park to North Sydney by 13 minutes – or more than two hours a week. 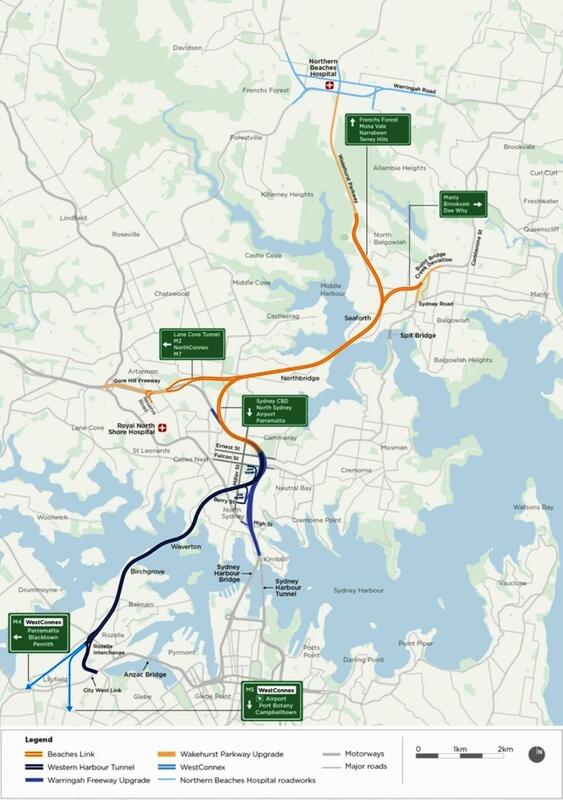 The Beaches Link will, for the first time, provide a motorway link between the Northern Beaches and the rest of Sydney. It will also reduce the travel time from Brookvale to the CBD by 27 minutes and slash a trip from Dee Why to the Airport by 41 minutes. Premier Gladys Berejiklian said since announcing a preferred route last year the NSW Government has listened to the community and massively improved the locations for the ventilation outlets, reduced the number of properties to be acquired to 37 and sought to minimise construction impacts. “We know the Western Harbour Tunnel and Beaches Link are important projects that will benefit the wider road network,” Ms Berejiklian said. “We also know this has been promised over many decades, but only the NSW Liberals & Nationals will deliver it because the strong economic management of this Government means these vital road connections are finally becoming a reality. Minister for Roads, Maritime and Freight Melinda Pavey said the NSW Government had committed $550 million to the projects in the recent Budget. The final cost will be determined when a final design and financing options from the private sector have been finalised. “We want to be up front with the community now and say the Western Harbour Tunnel and Beaches Link will be tolled, but as always there will be a free alternative,” Mrs Pavey said. The detailed design for the Western Harbour Tunnel and Beaches Link will now be subject to extensive community consultation until November, with feedback to be taken on board to refine the design, ahead of the planning assessment phase. Early works on the projects, expected to start later this year, include initial work around the Warringah Freeway and initial work to allow the Western Harbour Tunnel to connect to the Rozelle Interchange. Subject to planning approvals and finalised financing and procurement major construction is due to begin in 2020 with the tunnels expected to open to traffic by 2026. The Western Harbour Tunnel and Beaches Link are part of the NSW Government’s record investment in both public transport and roads, including Sydney Metro Northwest, Sydney Metro City & Southwest, Sydney Metro West, WestConnex and NorthConnex. Have your say by pinning comments to a specific location on our interactive map. Use our online tool to pin comments to a specific location on our interactive map. You can also see what others in the community have to say about this project. • During the exhibition period, community sessions will be held and formal submissions will be accepted by the NSW Department of Planning and Environment. This engagement program will conclude on Friday 9 November 2018. Once Roads and Maritime has received community and stakeholder feedback on the proposed reference design, Roads and Maritime will refine the design and prepare the Environmental Impact Statements (EISs). • Identification and response to issues raised by stakeholders and the community. The NSW Department of Planning and Environment will conduct the environmental assessments for Western Harbour Tunnel and Beaches Link. The EISs will be prepared in accordance with the Environmental Protection and Assessment Act 1979 and will address the Secretary’s Environmental Assessment Requirements (SEARs) issued in December 2017. The EIS documents will be available on the NSW Department of Planning and Environment website. You can sign up to our project mailing list to receive project updates by contacting the project team. See contact details below. You will be able to make formal submissions on any aspect of the project once the EISs are on exhibition. These submissions will be considered in the EIS assessment process. All submissions will be reviewed by the NSW Department of Planning and Environment and forwarded to Roads and Maritime for response. A report summarising the submissions and the Roads and Maritime responses will be published after the exhibition period. Roads and Maritime will continue to engage with the community and stakeholders in the lead up to the EIS exhibition, throughout the exhibition period and after it is completed. You can provide feedback to the project team at any time.